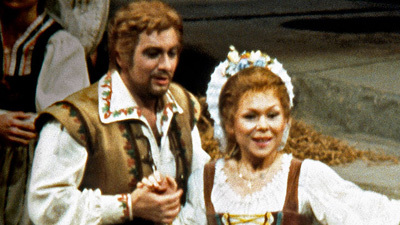 Conductor Thomas Schippers leads a sensational cast in a gripping opera that at the time of this broadcast hadn’t been heard at the Met in almost 40 years. As Luisa, Montserrat Caballé broke hearts, her beautiful voice and limpid singing conveying every nuance of the young girl’s plight. Richard Tucker is a passionate, enticing Rodolfo, the man she loves but does not really know. As Luisa’s tortured father, Sherrill Milnes demonstrates just how exciting a great Verdi baritone part can be. Ezio Flagello (Wurm) and Giorgio Tozzi (Count Walter) are evil personified.